Vacation! Day one had the Sculptor and I heading out at 4 AM (blurgh) for a 6 AM flight. Flight was pretty non-eventful, and Seattle came as a chilly, wet shock after dry, hot Arizona. Not unwelcome, mind you, but there's something in the brain (okay, *my* brain), that refuses to believe other places can have different weather than what you're used to where you live. Hence me insisting on running around in a leather jacket in Chicago in July ten years ago when I was still a San Franciscan. Saturday, we were both exhausted from little sleep the night before, so we kept our day to wandering around the downtown Seattle area. The Sculptor had an art gallery she wanted to visit. We headed down Third Avenue to the gallery, then back up on First Avenue. First is a lively waterside street with art galleries and shopping. The Seattle Art Museum is on that street, and has a really eclectic collection of modern art and indigenous museum pieces (some actually old, some art by contemporary locals). First Avenue ends at a big farmer's market complex, Pikes Place Fish Market, which is a cross between Fisherman's Wharf SF/Santa Monica Pier. In other words--a crowded, touristy food-and-shopping place. We packed into the crowds like sardines, and had seafood in a restaurant that overlooks Puget Sound. Gorgeous. 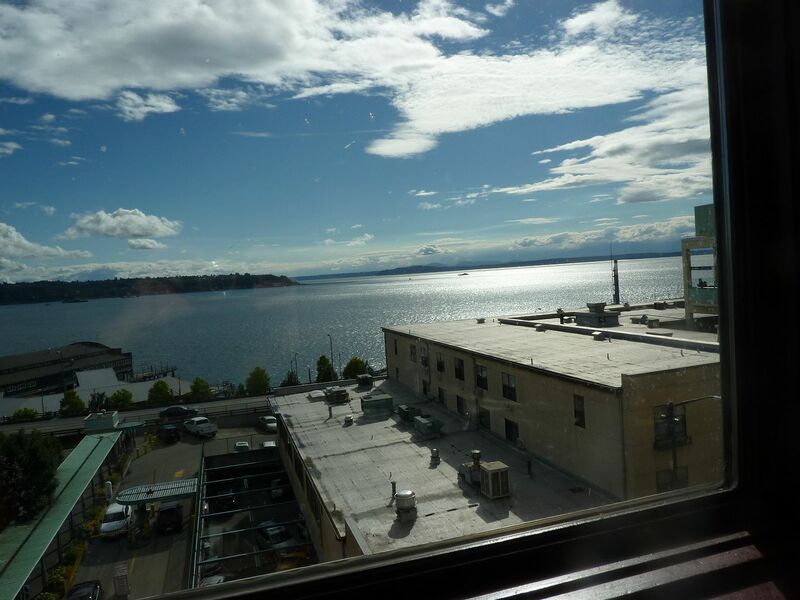 One thing we did not anticipate--didn't even think about--was a particular complication in staying in a downtown hotel in Seattle on the last weekend in June. The Pride Parade is going right past our hotel today. Our plans, of course, are stuff like the Space Needle and Chihuly Gardens. I haven't been to a Pride parade in jeesh, close to twenty years now. Partly because I've "done all that", and partly because Pride isn't celebrated in Arizona on the last Sunday of June. It's in April. So *that* explains the abundance of rainbow flags that greeted us on the light rail trip in from the airport yesterday. Seattle came as a chilly, wet shock after dry, hot Arizona. Yep, two of my strongest non-ATPo-moment memories of my trip to Vancouver, BC were the blast of cold, damp air on the jetway at Vancouver, and the blast of hot, dry air on the jetway in Phoenix on the way home. Yeah, we do the Pride Parade in October--I've always guessed because June is way too hot. Want to see pix of Chihuly garden! Will post a ton of pics when we return….